The Bolt, which has a range of about 385 kilometres, was the top-selling electric vehicle in Canada last year. 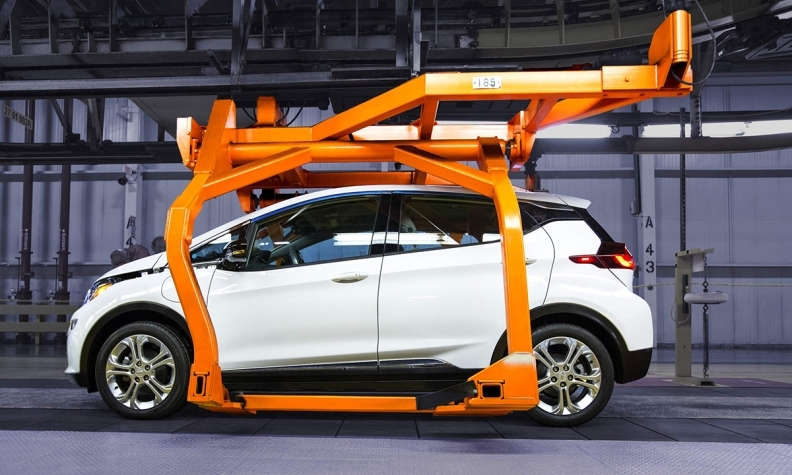 WASHINGTON -- General Motors will increase production of the Chevrolet Bolt later this year to meet rising global demand for the battery-electric vehicle, CEO Mary Barra told energy industry leaders Wednesday. GM built 22,398 Bolts in 2017, its first full year of production, according to the Automotive News Data Center. The automaker reported sales of 23,297 Bolts in the U.S. last year, though availability was limited to certain states until going nationwide in August. The automaker sold 2,122 units in Canada as part of calculated rollout that also took advantage of provincial incentives for electric vehicles. Barra did not say how much production would increase, and a company spokeswoman declined to discuss specific numbers, citing competitive reasons. Barra said GM can easily adjust the Bolt assembly line in Lake Orion, Mich., to expand production. The car is built on the same line as the Chevy Sonic, and the plant currently runs on only one daily shift. The Bolt, which has a range of about 385 kilometres (238 miles), was the top-selling electric vehicle in California last year, with 13,487 registered in the state, the California New Car Dealers Association and Auto Outlook said in a report this week. It was also the top-selling electric vehicle in Canada in 2017. As a bridge to all-electric and hydrogen fuel cell vehicles, the automaker continues to make its entire fleet of light-duty vehicles, including pickups, more fuel efficient, she said in prepared remarks for a speech at the CERAWeek energy conference in Houston. "Our commitment to an all-electric, zero-emissions future is unwavering, regardless of any modifications to future fuel economy standards," Barra said. Last year, GM said it would eventually phase out internal combustion engines in favour of alternative fuel powertrains and in early October announced it plans to launch a mix of at least 20 new all-electric and hydrogen fuel cell vehicles globally by 2023. Early converts will be based on the current Bolt EV architecture. Automakers sold 1.2 million plug-in electric and plug-in hybrids worldwide last year, mostly because of more affordable batteries. China and Europe are putting regulatory pressure on the auto industry to deploy EVs.